A portable lantern lamp that you can recharge using usb charging port. Bring it with you on camping trips, this modern style lamp is designed to be used outdoors. You can use the timber handle to hang it for overhead lighting too. Perfect for illuminating those late summer evenings. A miniature size bud vase. This handcrafted ceramic vessel has a white matt exterior with thin grey lines scratched into it surface giving it a subtle texture. The glazed interior makes it perfect to hold a single bud. Small in size, it would fit in the palm of your hand. A small ceramic bud vase. The matt white exterior is decorated with small blue dots that run in vertical lines around the surface. A glazed interior means you can use it to hold a single bud. Scandinavian ceramics inspired by nature. 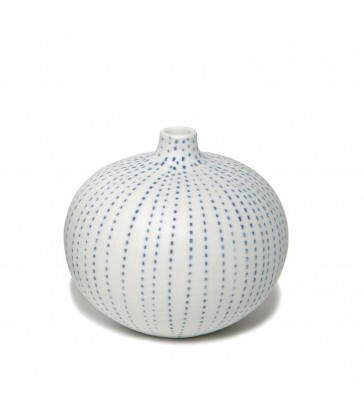 A large ceramic vessel perfectly suited for use as a vase with a glazed interior. 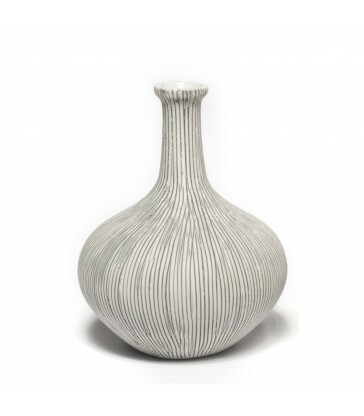 This bottle neck vase has a white matt exterior with fine grey lines scratched into the surface giving it a delicate texture. A modern Scandinavian design for your home. 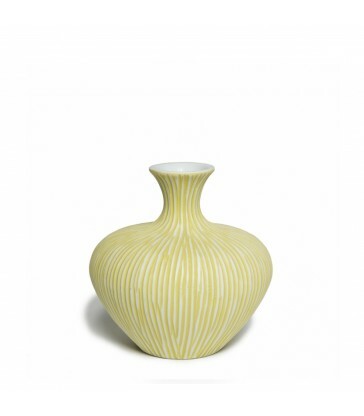 A modern Scandinavian ceramic vase in yellow and white colour tones. 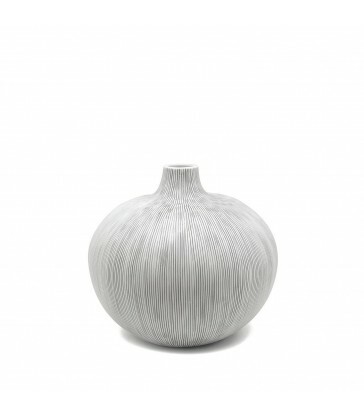 This two tone vase has a white matte exterior with scraped back textures to a yellow undertone. A beautiful handcrafted piece to display on your shelves or hold a posy of flowers in. 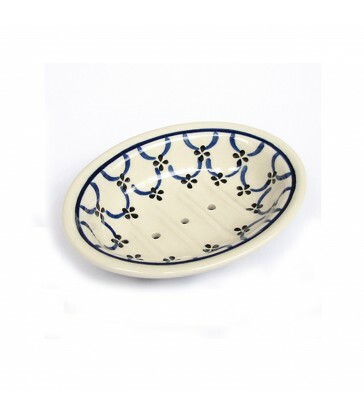 A beautiful decorative ceramic plate, perfect for displaying your collection of ceramic bud vases on. 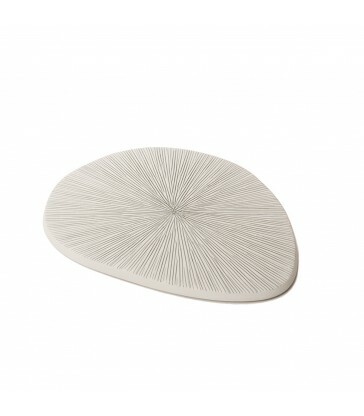 The plate has an organic tear drop shape, with a two tones grey and white surface and radiating lines from the plates centre. A decorative perfume vase with a long neck and stopper. This Swedish ceramic vase has a glazed interior so it can be used as a flower vase. It comes in two colours, grey or yellow. The surface has a scraped back texture to it revealing the colour underneath. Bedside or occasional table, our table lamp will look just right with its height adjustable. Base and lower stem are painted in a matt grey colour, whilst the top stem is in brushed steel. The matching grey shade is available in the 25/20 size. Dimensions: H55-65 Ø25cm Materials: Painted steel with a linen union shade. Bedside or occasional table, our table lamp will look just right with its height adjustable. Base and lower stem are painted in a stone colour, whilst the top stem is in brushed steel. The matching stone shade is available in the 25/20 size. Dimensions: H55-65 Ø25cm Materials: Painted steel with a linen union shade. A lightweight and beautifully designed wool pouffe. A modern Swedish design in a range of 4 colours. The perfect addition to your living room, move them easily to where they are needed, rest your feet and relax in style. The cover is removable for easy cleaning. Scandinavian foot stool in cream, grey, brown or black. Call us: + 353 (0)1 2301894. Enjoy 10% off your first order! Sign up now!